This past long weekend Andrew and I found ourselves sitting in front of the TV with Netflix looking for a movie to watch. It seems Netflix has a ton of TV shows, and not as many movies. Andrew suggested going to the video store to rent a movie. Weird. I haven't stepped foot in a movie rental shop in 10+ years! We ended up at the only place near our house, Family Video. It was everything I remember but with DVDs and Blu Ray's instead of VHS tapes. Membership was free and they have some rental specials for first timers including everything being half off your first 30 days of membership. Perfect-o, we are ready to try something different. The best part about renting movies is that some of them have previews that automatically play when you put the DVD in! Yay! 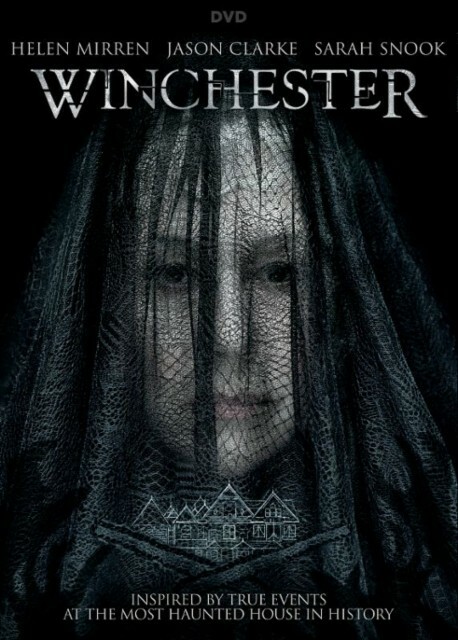 We rented a couple things including Winchester - not not Sam and Dean from Supernatural - but the haunted house movie about the Winchester Mystery House. It's based on a real house in San Jose, CA. It was built by Sarah Winchester, widow of the Winchester Rifle fortune. Her husband died, and her only baby daughter is died, and she was left with this house. It was in 24 hour never ending construction mode until her death in 1922. There is no rhyme or reason to the house, stairways that lead nowhere, windows and doors that lead to mazes. She felt immense guilt for making money off the "gun that won the west" and thought that the people that were killed with a Winchester were haunting her. Deemed the most haunted house in North America, much of the movie was filmed in the actual house, which I hate to say is better than the movie. To begin, we are introduced to Dr. Price, a man suffering from the death of this wife and some personal demons, who is hired to access Sarah Winchester to see if she's fit to keep the money from the estate. Once at the house he meets Sarah, Marion (Sarah's niece) and her small son Henry. Mary and Henry are suffering from the death of their husband and father respectively. Henry even witnesses his father's death and at one point gets possessed by a strong spirit. 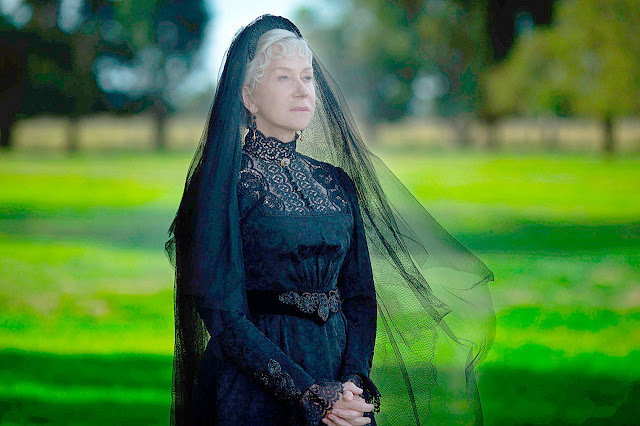 Helen Mirren that plays Sarah is a commanding presence with her shroud, somber look, and real Edwardian lace mourning dress. She explains that "this is the house that spirits built" she can feel them and see them. All the people that were killed by the Winchester rifle have unfinished business with her. They want her to reconstruct the rooms they were killed in. Once the rooms are complete, their spirits get stronger and they make contact with Sarah. She's responsible for so many deaths and shows them her guilt and grief so they can forgive and move on, then the room is torn down. Price doesn't believe her about seeing ghosts at first, then he starts to see dead people since he was shot by a Winchester and died for 3 min. at some point in his past. The demonic spirit that possessed Henry ends up being set free by Price and we get to see his tragic full back story. All the characters are struggling through tragedy. Lots of jump scares. It's really a haunted house, but it's no Hill House, a little slow in parts, and so so many many candles. I thought there was going to be a fire in the story. The ending suggests a sequel. Overall, the fashion and house were great, everything else was blah. I give it two hauntings out of five.